As you probably know already, smoking can cause serious harm to the soft and hard tissues in your mouth. But do you know why? Here are a few facts to help you along on your journey to quit smoking for good. If you do not smoke yourself, why not let your friends and families who are smokers know these facts too? Now, on to the good stuff! Quitting smoking may seem like an insurmountable feat right now, but there is help out there. New Road Dental Practice is teaming up with Lloyds Pharmacy to give you the best shot at quitting for good. When you book in with the Lloyds Pharmacy team in Croxley Green for a smoking cessation session you will receive a discount voucher for an amount off teeth whitening treatment with us! This will be a great reward from us and from you to yourself for managing to quit and may help you stay off of the cigarettes too, as you will not want to stain your new pearly white teeth! We also provide oral cancer screening and advice, just in case you need a little extra help. A fresh start and a fresh smile, all with the help of Lloyds Pharmacy and New Road Dental! For any more information or to book an appointment please call us on 01923 776 270 or email us at info@newroaddental.co.uk and one of our friendly Customer Service Advisors will be more than happy to assist. In todays’ modern age there are so many ways to stay connected and at New Road Dental we have just relaunched our “Facebook Page“. – competitions with fantastic prizes – our current competition to win the latest Oral B electric toothbrush ends 30th June 2013. We have a great competition running on facebook for the month of June. This advanced Technology Oral B 5000 has everthing you could wish for from a toothbrush! Dentist inspired round brush head cups each tooth to remove up to 99.7% of plaque in hard to reach areas when used in the deep clean mode. Pressure indicator on the back of the handle lights up when brushing too hard. Handle indicates when smartguide is connected. Wireless Smart guide real time feedback on 1. where to brush 2. How long you need to brush and if you apply to much pressure. The kit also has 6 replacement heads including Precision Clean, Floss Action, Sensitive, Power Tip, Ortho and TriZone. If you would like a chance of winning this brush then enter our competition on facebook by firstly going to the “New Road Dental Page” and clicking the “LIKE” icon, then secondly leave a comment on our toothbrush competition post. Good Luck . As the end of the school holidays draws near (yay!) you will probably be looking at new uniforms, pens, pencils, pencil cases and lunchboxes etc. 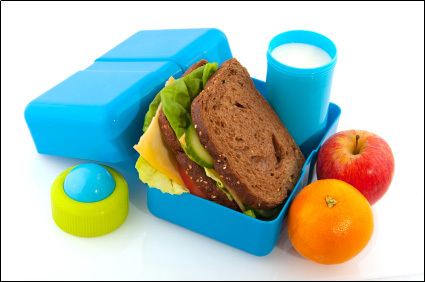 You may also be thinking about what to put in your children’s lunch boxes. Sugary treats and snacks such as cake and chocolate bars and fizzy drinks or fruit juices are often a popular choice. However, these types of treats and snacks, while delicious and appealing to your children, may come at the cost of their pearly whites! If your children aren’t keen on water they still need to keep hydrated. Provide mini cartons of no added sugar fruit juice instead of the full sized full sugar ones. Make the savoury part of the meal more interesting by using wraps, crudités with hummus or sandwiches cut into fun shapes etc. This way the ‘exciting’ part of the meal won’t be the sugary treats after their boring main. No added sugar yoghurt is good for a snack as they often contain a lot of calcium, which is good for healthy teeth and bones. Fruit is full of sugar and enamel damaging acid, but obviously we do not want to discourage healthy eating! Instead, maintain a good level of at-home oral hygiene care and this will help prevent cavities that could be caused by this. For younger children that get distracted easily while cleaning their teeth, let them do it in front of the TV or while they are reading a book using a beaker of water. They will often then spend longer with the brush in their mouths, not hurrying to get back out of the bathroom to do more interesting things. Once they are done only get them to spit out instead of rinsing with water as this will make sure the tooth paste is kept in their mouths longer.